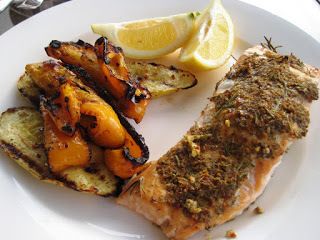 Salmon, especially grilled salmon, remains one of my favorite fishes full of fabulous nutrients, omega 3 fatty acids, and protein. I try to incorporate some sort of fish at least 3 times per week, and especially when the weather says … turn on the Grill! The following main course meal can be ready in 30 minutes. Side Dish: Grilled Peppers: Place 2 tbsp EVOO in a gallon size plastic seal storage bag along with seasonings that you may like. I enjoy organic herbs and crushed red peppers. I also add hot sauce for a little kick sometimes. Prepare veggies and slice in large pieces to place on grill. Put the veggies in the bag and shake around until all the peppers are well coated. Place on grill 10 minutes before the fish as they may take longer to cook. Grill to your liking. I prefer cooking until brown grill marks appear … Enjoy!